Next year's presidential elections offer a real opportunity of disposing a tired, weakened and unpopular Lukashenka, says Presidential hopeful Yaroslau Romanchuk. In this interview with David Marples, Romanchuk outlines a strategy for election and why his candidature offers the best prospect for the country's stalling economy. David Marples: Why did you decide to run for President? Yaroslau Romanchuk: I have a clear understanding of what and how we need to reform Belarus. I have strength, energy and determination. I have a team of professionals, who will form the skeleton of a future government. I have the support of organizations and structures from over 20 cities nationwide. The polls show 51% of Belarusians are ready for a new president. Indeed, 40% want that new president to be an economist. Lukashenka is starting his presidential campaign with an approval rating some 25 percentage points lower than the campaigns of both 2001 and 2006. And the chances of him getting those voters back are limited, especially in context of the “cold war” he has decided to wage with Russia, and the growing pressures in the economy. I am the only economist of all those wanting to be candidates; indeed, I am an economist to a much greater degree than I am a politician. I think I can win over the 40% of voters who support neither government nor opposition. It isn’t a romantic adventure, nor a personal PR project, but a measured, reasoned decision. DM: Is it really realistic to suppose that Lukashenka could be replaced at the 2011 elections? How could this happen? YR: I think that like no other presidential campaign in the past, this election offers a real chance of disposing of Lukashenka. First, it’s obvious to everyone that he is tired and exhausted, repeating the same clapped out ideas over and over again. He has no new faces in his team, no appropriate solutions for the economy, and no resources to continue his socialist authoritarian experiment. Second, Lukashenka is committing a big mistake by choosing a path of self-isolation. He has defied the EU and their hopes of a gradual liberalization. He has fallen out with Russia, which has supported Belarus materially, politically and diplomatically. He continues his standoff with the United States. Contact with Venezuela, Iran and Syria can hardly be considered an adequate foreign policy alternative. Third, Lukashenka has not understood the nature or essence of the global financial crisis. He is still a prisioner to an illusion that his model of state planning is in someway better than the rest. There is no liberalization of the economy. There is still an acute shortage of property rights. Any plans of privatization have been mothballed. Businessmen are tormented. Management is going crazy from top-down plans and absurd bureaucracy. Finally, Lukashenka is losing the support of his core vote: those who voted for him for reasons of stability, security of wages and pensions, friendship with Russia, or because because “there was no one else to vote for”. One thing is clear, Lukashenka will not win in the first round. For sure, he can paint himself some fake percentage or other. Indeed, he’s been doing this for some 15 years. But there is an obvious answer to such a turn of events. We’ve invested a lot of energy into this presidential campaign and have created a real consolidation of people fighting for the victory of democratic forces. We are supported by business and those who think Lukashenka is simply tired and should go. We work with influential civil society networks and are developing an innovative web-based media campaign. Clearly, if the opinion polls show a healthy level of support for opponents of Lukashenka, on the night of elections the number of people gathered in the centre of Minsk will not be 25 000, as it was in 2006, but at least twice that figure. Our position should be strengthened by exit polls. Demonstrating public support will be the most important lever in demanding the truth about election results. We’re prepared for any number of scenarios, including using EU mediators to enter into dialogue with the authorities. "Investigating such criminality should not have an expiry date. If and when I become president, I will do everything to ensure the guilty receive the proper punishment." DM: Let us just suppose you are elected President. What are the problems facing Belarus today that you would prioritize? Do you think Belarus is destined to economic decline, for example? YR: Belarus has yet to enter into a systemic economic crisis. Over 2008-2009, the government decided to markedly increase the level of foreign borrowing. The national debt has more than doubled to reach 50% of GDP this year. Four years ago, it was a third of that figure. For the first time in five years, the country ran a budget deficit. In 2010, this budget deficit may even reach 4% of GDP. In short, the economy is being pumped up on the back of credit, particularly in agriculture and construction. Inflation is chronically high, at 10%. The balances of payments and trade are running deficits of more than 13% of GDP, which threatens the stability of the Belarusian rouble. The current response to this predicament is inadquate. The government continues to redistribute more than 50% of GDP through the budget. It has blocked privitization plans. It has failed to liberalize prices. There is a chronic shortage of investment. Government spending is non-transparent, and goes some way to cementing old manufacturing techniques. Increasingly, the Belarusian economy is producing not what the market needs, but what the government demands. The reality of a transfer to world market prices for gas and the liquidation of any oil subsidy from Russia will only make the economic predicament of the Belarusian national plan worse. In such a situation, clearly, the economy has to take the lion’s share of our time. We have already developed - and are ready to pass - the following laws. First is a new law introducing an innovative tax system, featuring four taxes instead of the present thirty. The second is a law on liberalization, which will bring into play the 118 proposals advanced in the National Business Platform, which we developed with business over the course of four years. Third is a law on targeted government assistance for students and young people, a plan that we first presented to the authorities two years ago. The fourth is a law on privatization, for which we also have a ready draft. Unlike the Ukrainians in 2005, we have wasted no time in preparing for government. I’m under no illusions about the changes which are needed in the Constitution to redress the balance of powere. We plan to run a referendum on this six months following election. DM: How do Belarusian efforts to join the EU impact its strategic and economic relations with Russia (e.g. in the Eurasian Economic Community, or the Customs Union with Russia and Kazakhstan). Should Belarus turn “east” or “west”? YR: Framing things as a dilemma between “east” and “west” is a hangover from the Cold War. It’s the mentality of the Eastern bloc, an abstraction that gets in the way of formulating Belarus‘ foreign and economic policy. Yes, I think that, strategically speaking, Belarus should become a member of the European Union. It is an objective that will take at least 15 years of fundamental institutional reform, wide-ranging legal revisions and restructuring. That is if the EU wants to have Belarus. Today, that is far from clear. However, at the same time — I stress, the same time — we do need to re-establish a true partnership with Russia: one based on mutually beneficial, active institutions and agreements. Today, we have neither. The 1995 Customs Agreement between Russia and Belarus, for example, isn’t working. The project to create a “Union State” between the two countries has not moved on from the paper it was written on. The Eurasian Economic Community is a repeat of the Community of Independent States — a talking shop for bureaucrats and politicians. Meanwhile, the recent Customs Union agreement between Russia, Belarus and Kazakhstan is a project that needs to be grown. The main positions were agreed, but many sensitive issues remain. We’re talking here not only about energy resources, but also the payment of VAT, certification and identification of the country of origin. The numerous questions foreign investors ask — can a product manufactured in Belarus be freely sold in Russia? — have yet to find a clear answer. Belarus has more than 20 restrictions in place against Russian goods, and Russia has more than 10 restrictions against Belarusian goods. Belarus has a rule that 90% of food retail and 80% of manufactured retail should be of Belarusian origin. So we are some way away from a a zone of free trade, let alone customs union. I suggest we recognize the reality of the situation and place the horse before the cart. What we need now is a fully-fledged free trade zone, without exceptions or limitations. This will help us re-establish a true partnership and forget about the idea “friendship” being predicated on a generous hydrocarbon grant. However paradoxical it may seem, if we are to achieve a normalization of good relations between our countries, if we are to realize our partnership strategy with the EU and Eastern Parnership countries, we need a sound customs border with Russia. It it my firm view that such a foreign policy is in the national interest. It’s built on the principle of international norms and standards and the idea that we can be friends with anyone. We must look towards visa-free travel with our neighbours. After ten years operating in such an environment, people and politicians will find it easier to understand what is possible in the future: whether to intensify integration with the EU, right up to becoming full members of the Union, or to continute working in a zone of free trade and remaining members of international economic (WTO, IMF, the World Bank, EBRD) and political (OBSE, Council of Europe) organizations. DM: Should Belarus look to join NATO? YR: Taking into account the character and nature of the real threats our region and world is facing, understanding how Belarusians relate to NATO and to military blocs in general, and staying in keeping with a constitutional principle of neutrality, I don’t thing Belarus needs to look to membership of NATO. Realizing joint programmes, on the other hand, is clearly in our interest. DM: Much has been made of a recent collaboration between Belarus and Russia, which would see Russia build Belarus’ first nuclear power station. The project seems to have been held up over to money concerns. Does Belarus really need to build its own nuclear power station? YR: The authorities, it seems, have poorly understood the concept of energy independence. Suddenly, it sees a threat in being 100% dependent on the delivery of oil and gas from Russia. By the way, it sees this threat only in terms of the possibility of paying world prices for gas, and the refusal of Russia to continue hydrocarbon subsidy of Belarus. Likewise, the decision to build a nuclear power station was taken without a thorough analysis of economic expedience. It did not determine the crucial aspect of ownership of the facility, the conditions of its functioning, the means of servicing Russian credit, if such credit was made available to Belarus. In my opinion, Belarus does not need a nuclear power station at all. And, if work begins, you can be sure it will turn into the usual protracted construction, a “milking cow” for bureaucrats and politicians of both countries. There are other — cheaper — ways of ensuring uninterupted energy supplies to Belarus: by liberalizing the internal energy market, by privatizing the two Belarusian refineries and creating international consortiia for oil and gas pipeline management. There are also very interesting ideas about joint projects with Lithuania on constructing a LNG terminal. If we really need nuclear energy, perhaps we could also look to join forces with the Lithunaians who are looking at ways of re-developing the site of a former nuclear power at Ignalia. 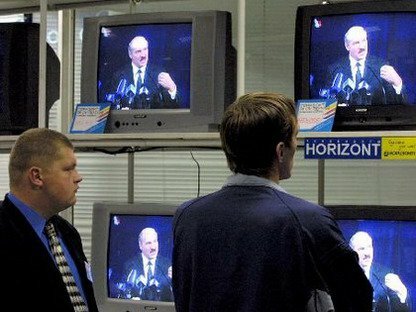 Many Belarusians are re-examining Lukashenka as President following the airing of incriminating documentary films on Russian television networks. DM: You have said that you would appoint Anatoly Lebedko, the chair of the United Civil Party, as Prime MInister if elected. Would you reach out to other groups in forming your cabinet, including members of the current government? YR: Certainly. I know many members of the government personally. They are professionals of high grade: people who do not occupy ministerial posts, don’t glitz on TV screens, but know their job. For obvious reasons, I can’t name them now. I’d also look to keep majority of civil servants in their positions: real administrative reform is not something you can accomplish in a month. But we would look to reduce the number of ministries from 25 to 8. We’d remove the practice of doubling up on functions. The Council of Ministers — the notional government — would become a real government, and not a secretariat of the presidential administration. We’d remove unconstitutional bodies such as the Operations and Analytical Centre, a structure which in recent times seems to have had greater control over decision making than the Council of Ministers. By reducing the functions of the executive (for example, by ending the State Committtee on Prices), we’d achieve a 30% reduction in the number of civil sevants during the first year of reform. 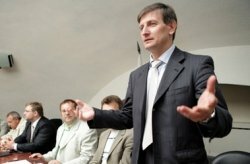 DM: Do you think Belarus should return to the position of the 1994 Constitution with a larger and more potent Parliament? YR: Absolutely. I stand for the restoration of the authority of parliament. I stand for a parliamentary majority forming the government. Presidential powers must be drastically curbed. The independence of the judiciary should be restored. We are already working on a draft of the new Belarusian Constiution, which we would put to the people in a referendum. It should be ready within a month of our victory. DM: Much has been made of the recent film “Godbat’ka”, which was shown on Russian TV, which implicates the Belarusian leadership in a number of serious crimes over the last two decades. If you become president, would you reopen am into these crimes? YR: It is a matter of honour that we have an independent investigation into these matters. I remind you that three of the subjects of this film Gennady Karpenko, Yury Zakharenko and Viktor Gonchar (murdered or disappeared - ed) were all members of my own party. We will uncover the truth about our friends regardless of our political campaigns. Investigating such criminality should not have an expiry date. If and when I become president, I will do everything to ensure the guilty receive the proper punishment.